In VMS’ role as a catalyst for change, we have designed customized Leadership Development Programs for a variety of clients. The programs typically take place over a period of 6-18 months and are reflective of and responsive to the realities faced by each organization. Because successful organizations rely not on a single leader, but on a team of leaders with a broad range of management competencies, in-house leadership development makes a significant contribution to an organization’s effectiveness. We suspect the appetite for learning is growing due to the pace of change and the increasingly complex nature of the work our clients are doing. In such an environment, the opportunity for a leadership team to develop their skills and to collectively reflect on, anticipate and design change is invaluable. 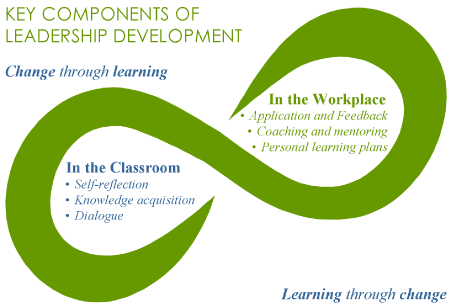 Our experience in developing these programs suggests that the collective learning experience is an opportunity for leadership and management teams to converse about and make sense of the changes that are taking place, inside and outside their organization. Their shared understanding provides a platform from which to position the organization for the future. In essence, the programs are a vehicle for shifting organizational culture. Our 2011 article "Change through Learning and Learning through Change at Kinark" illustrates how our approach was applied in a year-long customized Management Development Program. It can be downloaded here: Articles.